I had a great irish coffee bread pudding yesterday at work (moist, boozy, with a crispy caramelized top layer, topped with fresh whipped cream and caramel sauce ... sooo good! ), and was left craving more bread pudding today. I also wanted a warm dessert, paired with cold ice cream. 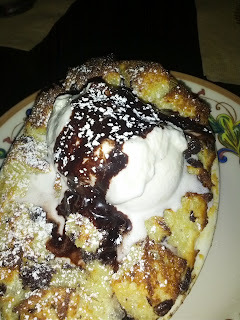 I remembered that a list of the best bread puddings in San Francisco included a warm chocolate chip version, served with ice cream, at Luna Park, which was two blocks away from where we were. We were able to walk in and get seated at the bar within a few minutes, so it was time to try it! Chocolate Chip Bread Pudding with Humphry Slocombe Vanilla Ice Cream. $9. I'm clearly used to eating at fancy places these days, as this dessert seemed massive to me. 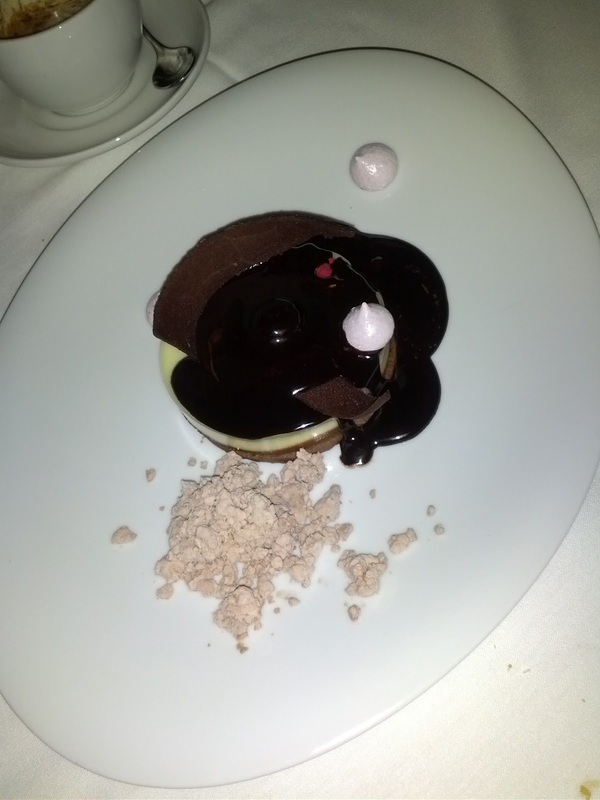 This was no dainty high end dessert! It was served warm, topped with ice cream, and cold chocolate sauce. This should be exactly what I love ... warm desserts with cold ice cream are some of my favorites (when I'm not busy on a crème brûlée obsession). Particularly warm crisps/cobblers/crumbles/etc once stone fruit is in season (I can't wait!!!). Anyway, like I said, this should just totally hit the spot for me. This particular dessert is raved about and I've seen it on a bunch of "best dessert" lists over the past few years. Anyway. It was served warm, which was good. In fact, some parts of it were downright hot, which I really appreciated. Unfortunately, this also meant that the ice cream melted within seconds. I snapped the photo the moment it arrived, and by my second bite, there was no ice cream to be found. It had all completely melted into the bread pudding. This had a number of unfortunate side effects. First, obviously, I didn't get to enjoy the ice cream, nor did I get the contrasting pairings of warm and cold, crisp and creamy that I was looking forward to. It also made the bread pudding itself just turn into a pile of mush. And the bread pudding was fairly sweet, and now pretty homogenous, so there was no way to cut the sweet with a spoonful of ice cream. The edge pieces of the bread pudding that didn't absorb all of the ice cream were still crisp, and fairly nice in that regard. I'd say the bread pudding was well executed in the cooking sense, warm and crisp. The chocolate sauce on top was thin, watery, and cold. Basically Hershey's syrup. Meh. The bread pudding part was just sweet and lacking any dimension, was soggy and kinda nasty, and the chocolate chips, while decently melted inside, weren't particularly flavorful either. There really was just nothing good going on in this dish. I felt like this was a textbook example of a really bad bread pudding that gives bread pudding a bad reputation in the first place. Of course soggy, flavorless, too sweet, mushy bread isn't desirable! Would never get again. 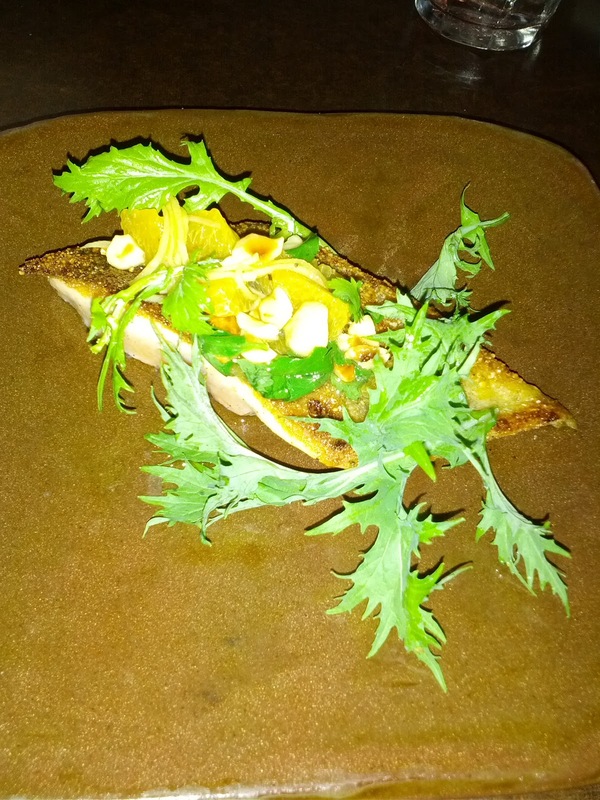 State Bird Provisions opened on January 1st, and has been seriously hyped ever since. I've been interested in checking it out, but assumed most of the hype was just due to the novelty of their original concept: "Californian" cuisine, but served dim sum style! ZOMG! Reservations have become impossible to get, other than booking the furthest date out the moment it hits the online reservation system. I was awake at 3am one night a month or so ago, and found an open reservation, so I decided to book it, even though I was still skeptical. I'd forgotten about the reservation, until last week, when several prominent food critics published their reviews, and I realized my reservation was approaching. They liked it! In fact, every review I could find was incredibly positive, both from the masses on Yelp (who mostly were just amazed at the concept) to food bloggers and critics everywhere. Everyone raved about ... everything. I was excited to try it out! Walking into the restaurant was a little overwhelming. It was packed. You enter in a long narrow hallway, one side lined with people waiting, and the other filled with people standing and dining. Yes, you read that correctly. In case you didn't make your reservations a month ago, you can show up and wait for one of these standing tables, which are walk in only. These were added recently, and are a pretty fascinating move by the owners. They didn't have space to put in more tables and chairs, but people standing along the counter take up very little space. And they wanted to be able to accomodate some walk-ins. In exchange, people dining in this space also get to watch over the open kitchen and get first pick of the food as it comes out. I'm not sure I'd want to eat my entire meal standing up like this, but the tradeoffs are pretty interesting. The host stand is at the end of the hallway, and we had to kinda fight our way through the people waiting to get to it. Although we had a reservation, we had to wait about 10 minutes for our table. I didn't mind, as we were able to watch the dishes coming out, and get a sense of what was available. It was also fun to watch the open kitchen. And I got some tips from another person waiting on what dishes were the best (he was a repeat customer). Once seated, we were presented with a wine bottle full of water (a nice touch, we could easily refill our own glasses) and a brief explanation about what to expect. It was your basic dim sum setup: there would be a cart offering some cold items, servers with trays offering small hot items, and then there were additional larger hot main dishes and desserts we could order from a menu. Everything was small plates and designed to be shared. This concept works well with dim sum because most of the items are individual, or at least, easily cut up. This was not the case for the dishes served here, although I can imagine plenty of "Californian" dishes that would be fine for this format. In fact, most of these dishes were incredibly difficult to share. We were not provided with any serving utensils, and no dishes were cut up in any way by the servers. I really don't understand this, as the entire concept is that it is tapas style. I'm dining with friends, and I'm not all that concerned about germs, but it really would have helped to at least have a real knife to cut things and a spoon to use to serve some of the sauces. It was also incredibly loud in the restaurant. The space was all hard surfaces, and there just seemed to be nothing to dampen the noise. We were only a group of three, at a small table, and absolutely could not hear each other without considerable effort. This made making joint decisions on what to order even more fun. Prices were shockingly low. Yes, they were small plates, but I think the average dish was about $7. Really, not bad at all. The flow of the meal was a little odd, but this can be fairly common at dim sum. There were plenty of lulls of no food making its way to us. We were seated about halfway through the restaurant, and a number of dishes ran out long before they reached us. Clearly, sitting closer to the kitchen results in a much faster dining experience, and you get much hotter, fresher, items. We actually passed on a few items that we'd seen taking way too long to make their way to us (like one that looked particularly good, but had a poached egg, and had been circulating for about 8 minutes by the time they finally reached us). There was way, way too much oil used in everything. I'm not worried about a little extra fat in my food, but it really overpowered and ruined a lot of the dishes. That said, there was one dish I really loved, and two that I found quite good. But the rest ... they just weren't very good. I don't really understand the rave reviews. I'll keep following the reviews of this place, and if they stay consistently positive, and the menu changes up, I'd consider going back and trying it again, but I'm definitely in no rush to go back, and would not order most of the dishes we received again. Smoked trout with bread salad. $6. First to arrive at our table was the cart. 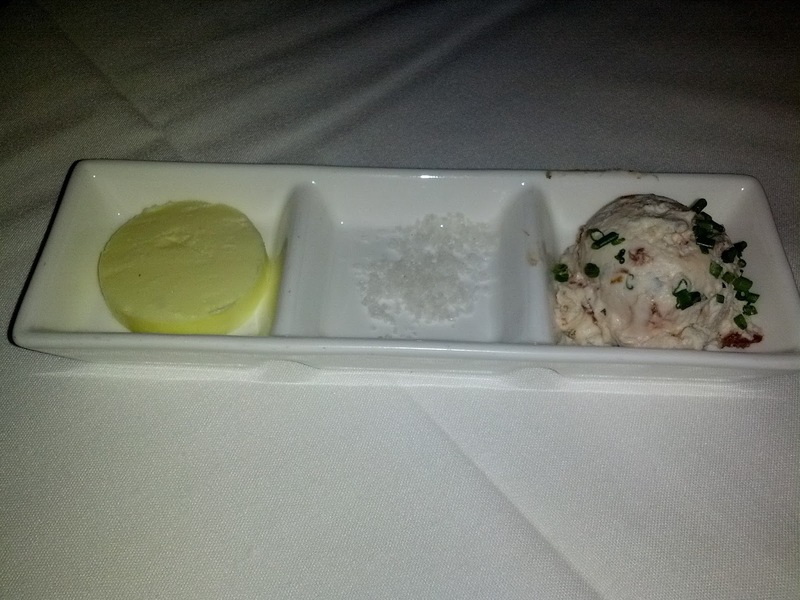 It contained cold dishes only, including this one, described as a smoked trout mousse with bread salad. This sounded really great ... but really wasn't. My least favorite dish of the evening. The smoked trout was supposedly mixed with a whipped crème fraîche to form a mousse. I didn't taste any trout at all. Nor smokiness. Nor did I get any tartness from the crème fraîche. In fact, it just didn't taste like anything at all, just a creamy substance with a strange mouthfeel that coated the inside of your mouth when you ate it. The bread salad was made up of very crisp, very oily, chunks of bread and some pickled vegetables. The pickled vegetables were fairly good, but everything was just drowning in oil, as you can see in the photo. Tasteless mousse, hard bread, and a vat of oil? This was not a good dish at all, I'm really not sure what they were going for here. SKIP! Hass avocado with seafood ‘salsa’. $8. Also from the dim sum cart, a cold seafood 'salsa'. This one was rather ridiculous to share. It contained two tortilla chips, each of which were incredibly hard. We struggled trying to break these in half to share. They were also insanely oily, as you can see the glistening in this photo. They weren't particularly good. 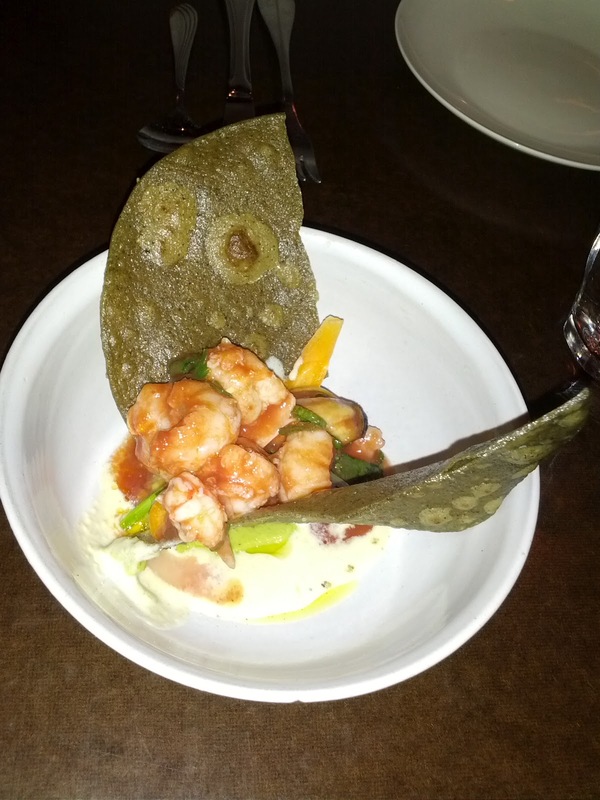 The seafood mix included a few chunks of shrimp, two slices of scallop, and a single mussel. Um, very hard to share. The seafood was all cooked well enough, but wasn't particularly noteworthy. It was tossed with lime, jalapeno, and Dirty Girl tomato sauce, which was really light, refreshing, and tasty. This was all on top of a whipped avocado base, which I didn't try, as I'm allergic to avocado. Overall, there were some good things going on here, with a fun play on chips, salsa, guac, and seafood, but it really didn't work as a share plate, and just wasn't that great. Fourth worst dish of the evening for me, and I wouldn't order again. ‘green garlic bread’ with burrata. $8. One of the dishes from a tray. This was, hands down, the dish of the evening for me. I LOVED this. The others at the table thought it was ok, but weren't all that into it. 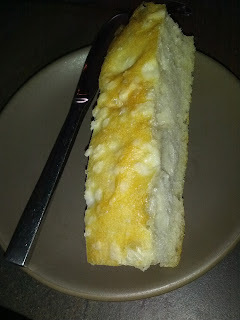 The 'green garlic bread' was super crispy on the outside and soft on the inside. Insanely fried and oily, but in a way that worked. It reminded me of the fried dough I used to get at the state fair as a child, except that it was savory and infused with green garlic flavor, rather than powered sugar. 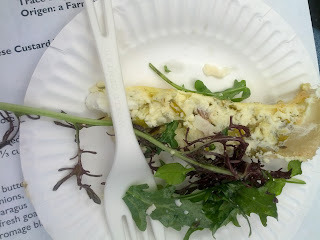 The use of green garlic was perfect, as it was fairly intensely garlicky, but not in a bad way. The garlic went really well with the oil, the bread, and the cheese. 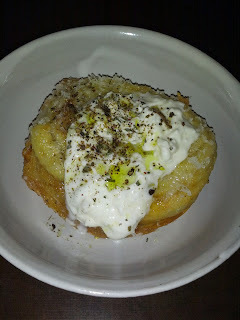 It was topped with fresh burrata, which had a really good flavor, and was a nice contrast in texture as it was incredibly creamy, and the bread was crisp. The burrata was topped with, you guessed it, more oil and some cracked pepper. The oil seemed very unnecessary given how oily the bread was. It was also really difficult to share. We had only butter knives, which couldn't really cut through the crispy bread. Even though this was just about the most unhealthy thing imaginable, I loved it, and would order it again. I had far more than my portion of this dish, and if anyone else had seemed remotely interested, would have ordered another one that night. Red trout, mandarin, hazelnuts and garum brown butter. $9. This was one of the main dishes that we ordered from the menu. Available in two sizes, we opted for the small. And another really hard to split dish. The trout was served with the skin on, making it really hard to cut up with our butter knives. 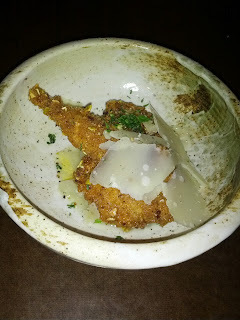 The trout was crusted in rice flour, skin on. It was well cooked, moist, and flavorful. The skin/crust was really crispy and salty, and reminded me of a chip. Good execution all around here. 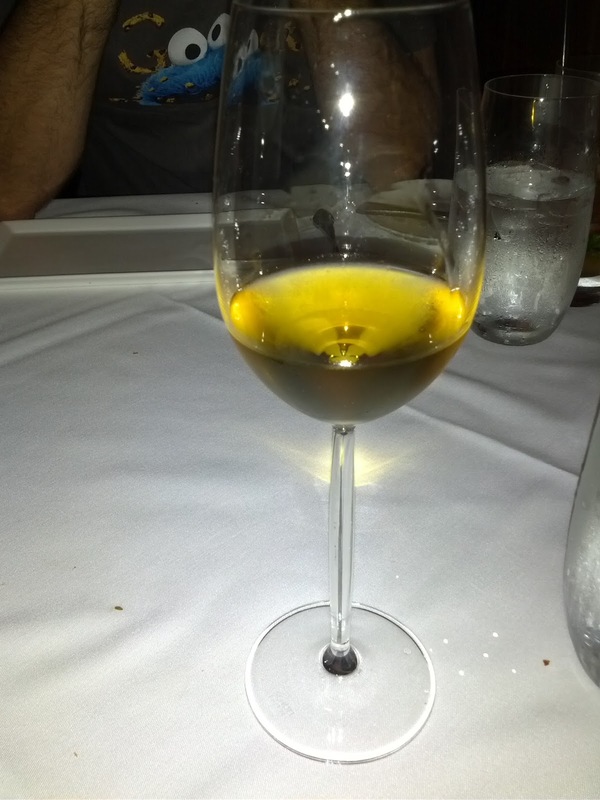 The brown butter sauce paired very well with the hazelnut, and had a complex nutty flavor. The mandarin and the greens were necessary to lighten up the dish, and were a successful flavor pairing as well. While not a huge piece of fish, for $9 this seemed like a very good value. This was my third favorite dish of the night, and I'd order it again. Earlier in the day, they posted a photo to Facebook of a huge eel. 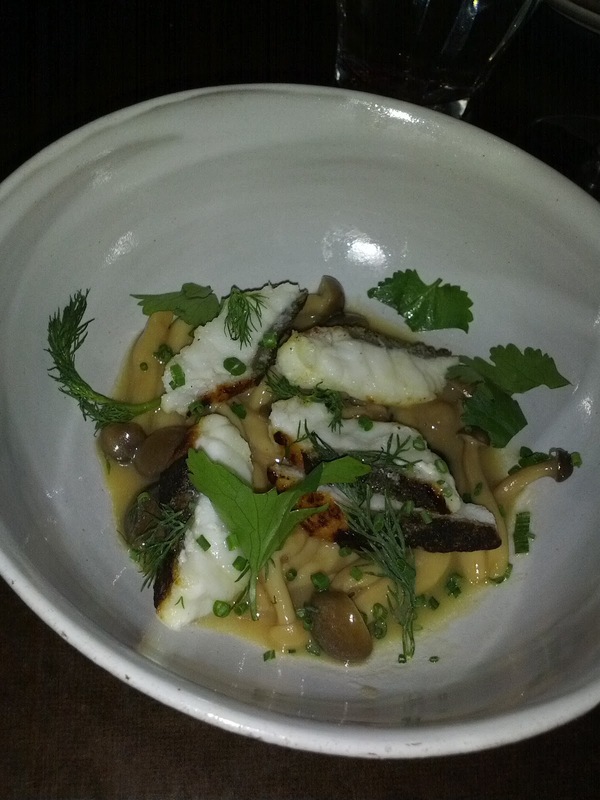 And then, our server mentioned to us that they had an eel special that night. We had no idea what to expect, but figured it was worth trying. I've never had eel like this before. In fact, I think I've probably only ever had eel at sushi restaurants. The eel was served skin on, and was such a strange texture. It was sorta spongy and gritty. I didn't much care for it. There were tons of shimeji mushrooms in the dish as well. They were kinda slimy, but I enjoyed them. The whole thing was in a soy lime and eel stock based broth that was a little salty, and not very good. This was my third least favorite dish of the evening, and I would not order it again. Asparagus ‘frites’, anchovy & parmesan. $5. From a tray. We ordered this mostly because we had a really, really long lull in food at this point. We were bored and wanted some food. Also, it is asparagus season, so we thought it might be good. 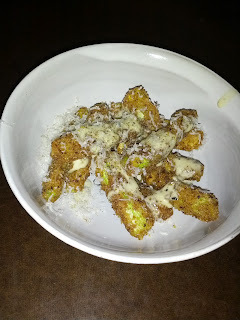 The asparagus was breaded, fried, and incredibly oily. All I could taste was oil. Seriously, had I been blindfolded, there is no way I could have possibly identified the asparagus. The breading layer was thick, not very flavorful, and fell off when you bit into the fries. I hated these. On the other hand, the anchovy sauce and parmesan had really nice flavor and paired together well, in a classic caesar sense. I stripped the nasty breading-oil off of one piece of asparagus and just dipped it in the anchovy sauce and parmesan cheese, and it was actually really nice. Had they just grilled the asparagus and served it with this sauce and cheese, it might have been pretty good. At least this was easy to share? My second least favorite dish of the evening, would certainly not order again. CA state bird with provisions. $8. This is their signature dish. None of us really care for quail, and had decided that even though it was their signature dish we were going to skip it, but the guy standing next to me while we were waiting insisted that this was amazing. So, we ordered the small size from the menu. The quail came breaded with the same coating as the asparagus fries, although it wasn't quite as thick and wasn't quite as oily. It still wasn't that good, but it was nice and crisp. The quail was moist and better than I expected, but, it was still quail, which meant that it was loaded with bones and was really just a pain to deal with. So much work to get a little meat off of it, particularly when breaded. And, speaking of hard to share dishes, how on earth do you share this? The "provisions" were onions stewed in lemon and rosemary, that were incredibly soft and actually fairly tasty, and some large shavings of parmesan. The parmesan didn't really seem to go with the quail. Fifth least favorite, and I wouldn't order again. Duck liver mousse with almond financier. $5. I've clearly been on a foie gras kick, and have been loving mousses and pates of all sorts, so I was very much looking forward to this dish. I saw several other tables with it, and had read about it, but it hadn't made its way to us yet, and we were pretty much done with trying things at this point. So, we asked about it, and it arrived. The mousse was really creamy. It had a very, very strong liver flavor. It wasn't particularly complex nor did it have any other flavor components to balance it, but the mousse itself was pretty successful. The almond financiers sounded like a really interesting pairing. I love baked goods and sweets, so I thought this could be really good. And, I still think it could, except the execution on these was horrible. They were, like so many things that night, way, way, way too oily. They were also really mushy inside, like they hadn't cooked properly. But the overwhelming issue was how oily they were. It not only ruined them, but it ruined the pairing as well. You didn't want oil with the mousse. This dish was on to something though. The mousse was good, and I can sort of imagine that if the financiers had been better, this really could have worked ... I think. It would have benefited from another component however, like a huckleberry compote or something. Still, for $5, this was a good value. My 5th favorite dish of the evening. 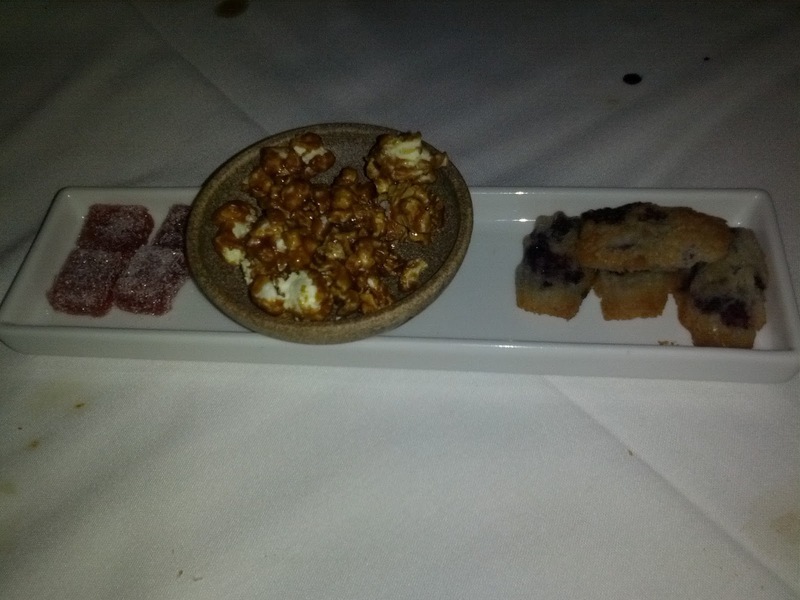 I'd try ordering this again, as it seems like something had just gone wrong with the financiers. 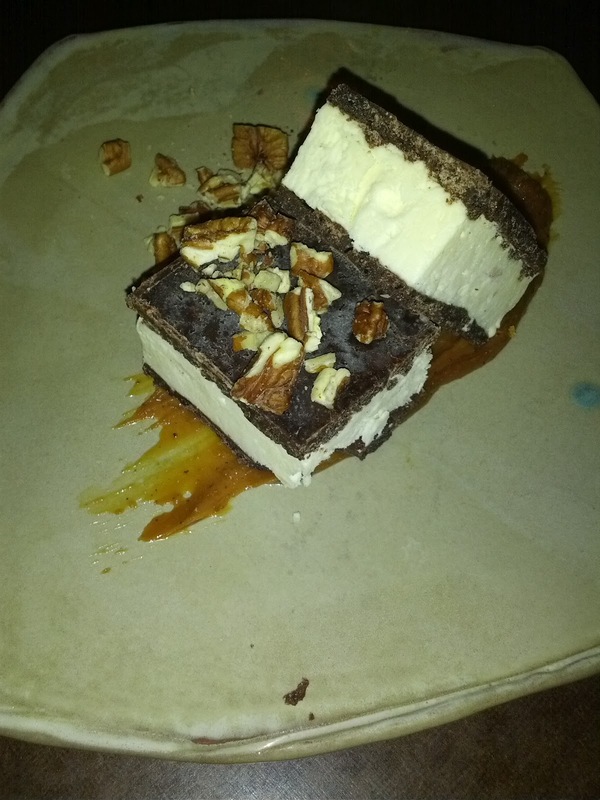 Caramelized white chocolate ice cream sandwich, pecans. $6. 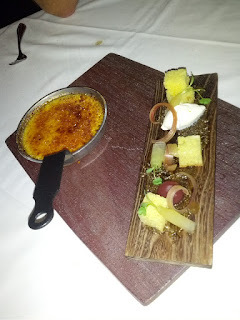 On the bottom of the plate was the caramelized white chocolate puree. This was basically a thick, sweet, pretty tasty, caramel. I didn't really taste white chocolate at all, but it was good, and I certainly devoured all of it. The ice cream sandwiches were made up of crispy chocolate cookies, which were sweet, delicious, and had a really interesting texture, I think from cocoa nibs. Sort of a cross between a cookie and a chocolate bar. Inside was fairly generic ice cream. They were topped with some chopped up pecans. This was a little hard to eat. If you pick it up to eat it with your hands, as you would an ice cream sandwich, you don't get any caramel or pecans. But we were provided only with spoons, which you definitely couldn't use to cut through the frozen cookies. I ended up picking it up, and then using the spoon to scrape up the caramel, and kinda plop on spoonfuls of the caramel onto a bite before I'd take it, placing a pecan on it as well. I think these components in a different form factor would have been more successful, like an ice cream sundae with the cookie chunks broken up as a topping. No one else liked these, so splitting wasn't an issue, as the entire dish was mine. I'm not sure why they didn't like it, as I found it really quite delicious. Chocolatey and sweet, ice cream, pecans, and caramel ... kinda hard to go wrong? $6 seemed like a reasonably price. Second favorite dish of the night, I'd get this again. ‘world peace’ peanut muscovado milk. $2. This was the other dish I'd read about and was really excited for. 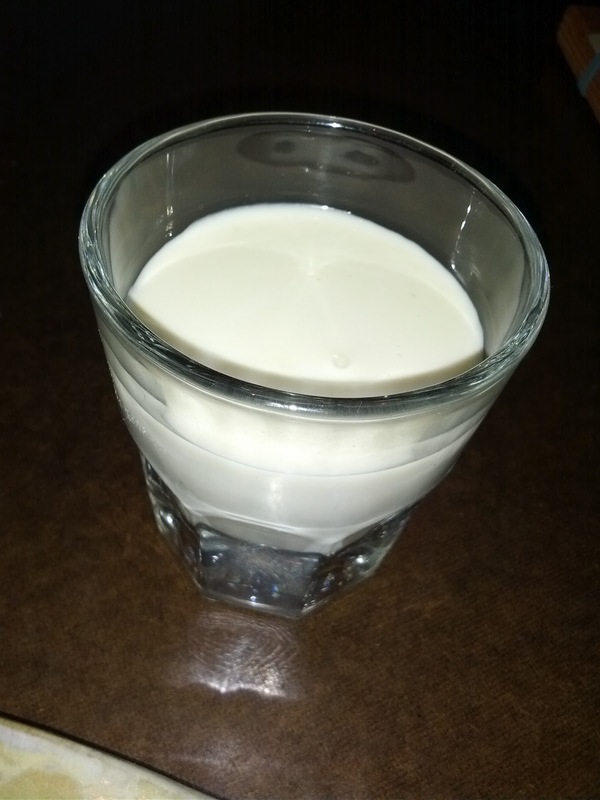 Described as a “liquid peanut butter cup”. Oh man. It is basically a "milk" made from toasted peanuts, that have been steeped in milk, cream, and sugar. It didn't really interest me too much though. It was just ... peanuty, slightly sweet, milk. 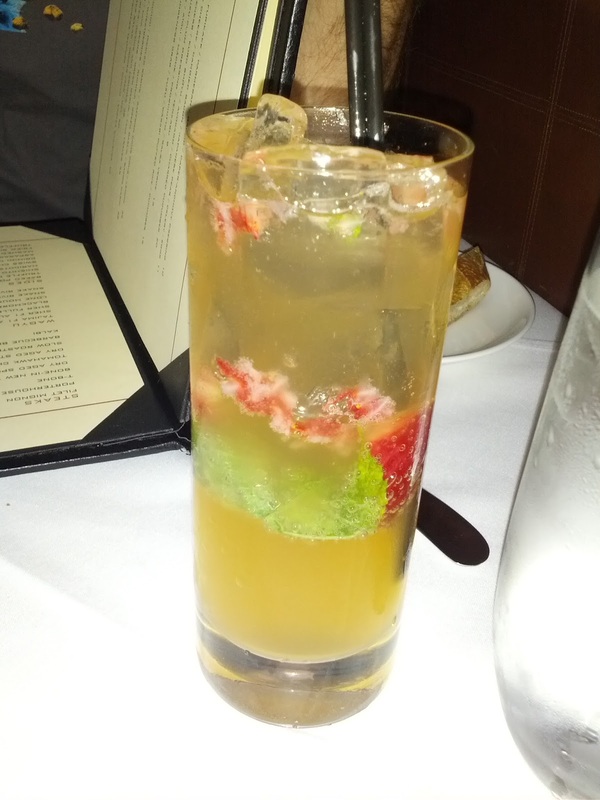 Enjoyable enough, my 4th favorite of the evening, but I wouldn't order again. One evening, we "needed" foie gras, but didn't want a full dinner. So, we headed across the street to Prospect, where I knew the bar served a great pate with foie in it. 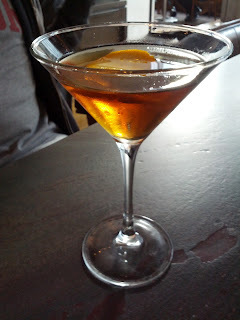 We've dined in the bar area at Prospect a number of times, and I've reviewed it before, so I'll skip the general details, and focus just on the details from this visit. The bar was full, so we sat at the walk in communal table instead. It has standard waiter based service, not quite the same feel as being at the bar where you can interact with the bartenders, but still a nice option for being able to walk right in. We ordered a mix of bar snacks, starters, and mains. The Ambassador : Rye, Bonal, Apricot Eau-de-Vie, Zucca. $11.50. I only tried a sip of this, but it had a nice bitterness to it, and like all of Prospect's drinks, was really well balanced. Duck liver, foie gras & bacon pate: spiced red pepper jelly, warm crostini. $8. This was the dish we came for. Last time I was at Prospect, I LOVED this. Couldn't get enough of it. This time, it seemed like the recipe was slightly different. 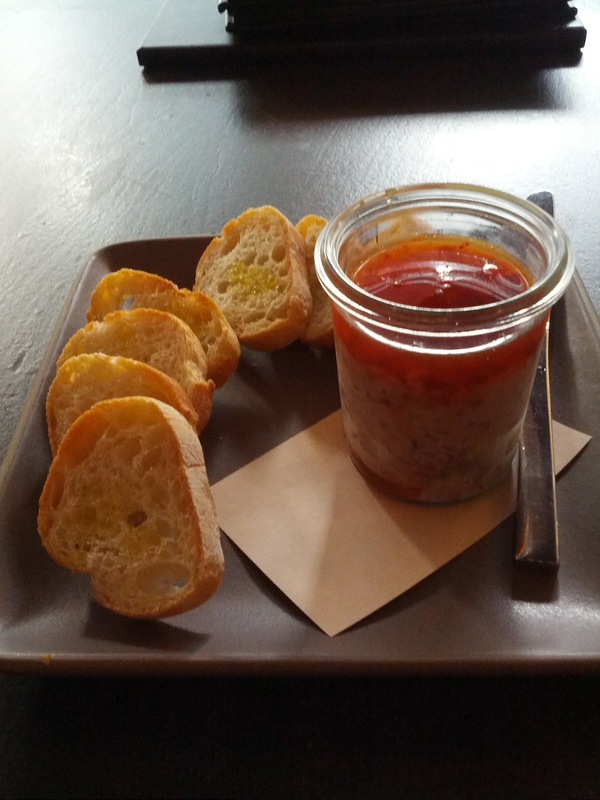 It is a creamy pate, studded with bacon chunks, topped with red pepper jelly. Last time, I adored the bacon flavor, and the saltiness the bacon added. This time, the bacon barely came through, although it was clearly there, as I could find the chunks in the otherwise creamy pate. Last time, it didn't have much foie gras flavor, this time, it had more, which I should have liked, but somehow the flavor just didn't pop. The layer of red pepper jelly was much thicker this time, and I felt that it overpowered the pate, it was hard to get to the pate through all the jelly. The jelly had a very strong red pepper flavor. I think the biggest issue is that it seemed under-salted. Last time, the bacon definitely added some of the smoky component and that was missing this time, but it seemed under-salted in general. We scraped the salt crystals off of the butter that came with the bread, and added it to the pate, and that was much more delicious. I'll still order this again, and hope the recipe is more like the first time. Focaccia (on the side, requested). Last time, we thought this paired really well with the pate, so we asked for it again. It was served cold, which didn't work as well as when it was warm before. The salt crystals on the top did help address the under-salting of the pate however, and it was again a better pairing than the crostini that come with the pate. Dungeness crab cakes, remoulade. $7. Crab cakes? No, these were crab balls. I'd had these in the past, so I skipped them this night. My memory is that I was disappointed with them, being more fried and bready than crabby. 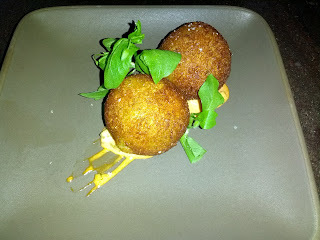 Wild mushroom arancini, aioli. $5. When these showed up, we thought they were another order of the crab cakes. They looked almost the same! The shell on them was really nice and crisp, although they were kind oily for my liking. I didn't really taste the mushroom in the filling, just creamy rice, which was disappointing. I expected a more cheesy flavor as well. 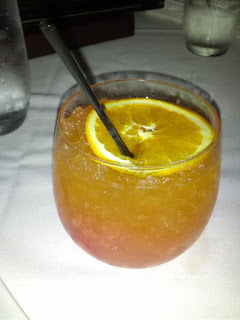 The aoili was really thick, and not very flavorful. I didn't really like these, and wouldn't order them again, but $5 seemed like a great value. Wild salmon crudo, beech mushrooms, grapefruit, sea beans, avocado puree, rice crackers. $16. This was the first dish added to the menu from the new chef! The fish was a good cut, decent quality, although not that flavorful. 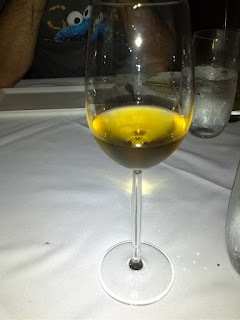 The citrus and sea beans were a really refreshing, bright, and light pairing. The tiny itty bitty beech mushrooms were pickled, adding an intense vinegar flavor to bites than included them. 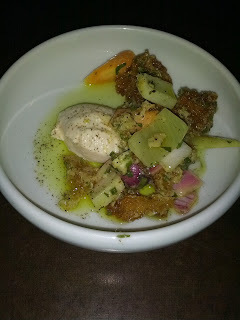 I wouldn't go out of my way for this dish or rave about it, but it was nicely done, with a good balance of flavors. Seared Monterey Calamari & Gulf White Prawns, Romesco, Deep Fried Butter Beans, Sherry Shallot Vinaigrette, Peppercress. $14.50. I did no have the prawns or calamari, but the folks who ordered this said they were well cooked. The deep fried beans were really not good. The deep frying process made the skin on them way too crisp and really unpleasant to eat. Additionally, all you tasted was oil. The romesco sauce had a great spicy kick to it. I wouldn't order again, just because of the horrible beans! 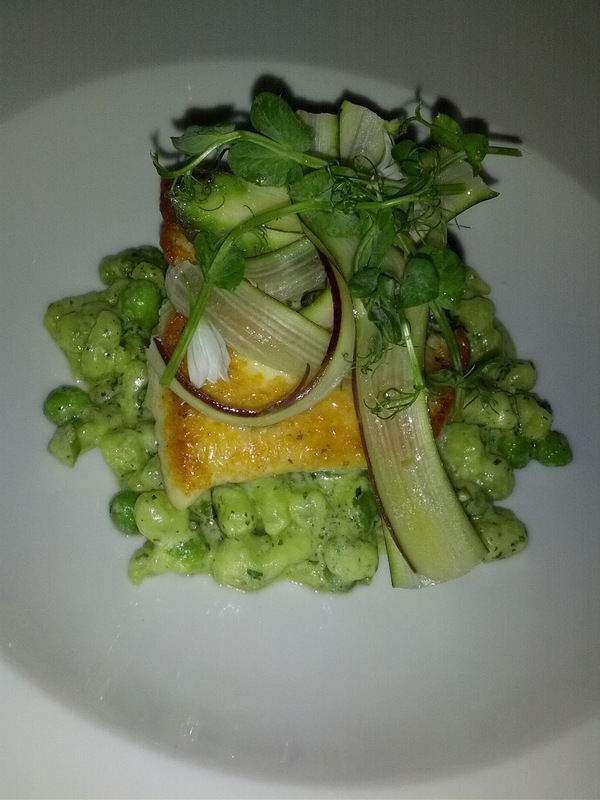 Northern Halibut, Zuckerman Farms Asparagus, English Peas, Herb Spaetzle, Shaved Purple Asparagus Salad, Lemon Vinaigrette, Chervil. $32. The halibut was well cooked, with a crispy nice crust on it. It was slightly fishy however. I've been adoring peas and asparagus lately, as they are so fresh and delicious and in season right now, so I was really looking forward to them. However, I felt that they weren't that flavorful in this dish. I'm not really sure why, but I would have loved to seem them highlighted more. I enjoyed the contrasting textures from the soft the peas and spaetzle with the crisp shaved asparagus. I wouldn't get this again, and didn't feel the $32 price tag was really justified. It was well executed, but the flavors just didn't pop for me. Today's first demo was by Daniel Clayton and Trace Leighton from Origen in Berkeley. They describe their restaurant as "farm to fork", with a very seasonal menu, including a five course chefs tasting menu designed to highlight whatever is fresh. Throughout their demo, their love for the market and local farms was clear, and although I've never been, I'm sure this carries over into their restaurant. They knew the names of every merchant, told many stories about shopping at the markets, and were clearly passionate and committed to buying as many ingredients as possible from vendors whom they knew and trusted. Their love for sourcing quality ingredients, cooking, and food came through very strongly and was inspirational to watch. They were also very educational, telling us some details about local ingredients that I wasn't aware of - like how farm fresh eggs have larger (and yellower) yolks than standard grocery store eggs and how Miner's lettuce is too fragile to transport, and has a really short season, but grows wild here (which must be why I'm seeing it EVERYWHERE these days). They also gave practical tips of home cooks, like how it isn't necessary to buy fancy pie weights to make a tart shell, just press it down with your hands! For the demo today, they showed an example of their approach to farm fresh, taking a base recipe for a goat cheese tart, and adapting it to use what was fresh and awesome at the market. Goat cheese custard tart, with fresh greens and citrus vinaigrette. The fresh greens used were mizuna, arugula, mustard, and rapini. They were a really nice fresh compliment to the tart. The tart shell was fairly generic, but well made, and didn't overshadow the filling. The custard filling included asparagus, which paired really well with the goat cheese that dominated the flavor of the custard. The citrus vinaigrette was refreshing, slightly tart, and tied everything together. 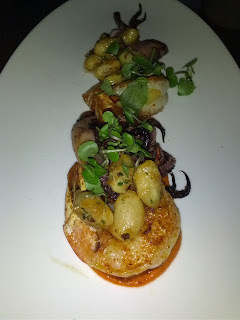 This was a very well balanced dish, and the flavors, while strong, were all complimentary. It was also easy to see how you could change this up slightly as the season changed to use other ingredients instead. Stop #2 on last week's frozen yogurt crawl in Cupertino: Orange Tree. This is another self-serve, pay by the ounce setup. They offer 10 flavors at a time, and some toppings. It was much worse than stop #1, Yogurtland, in pretty much every way. Fewer flavors, far fewer toppings, but more significantly, the yogurt was also not nearly as good, it was not creamy, and the flavors were clearly fake. I wouldn't go back here. I *think*, but am not certain, that they use YoCream. I didn't see signs, but I'm guessing based off of the flavors offered, and the fact that I didn't like it! I don't know why everywhere carries such a mediocre brand! Vanilla: Tasting notes: runny, watery, no flavor. Chocolate: Tasting notes: runny, not much flavor. Cheesecake: Tasting notes: not creamy, no flavor, just sweet. Cookies and cream: Tasting notes: not creamy, just sweet, no real flavor. Coconut: Tasting notes: not much flavor, not creamy. 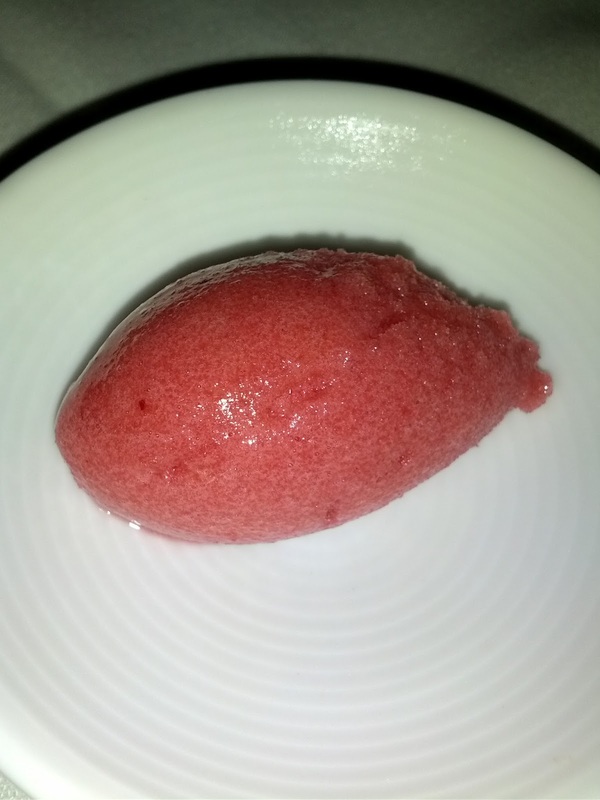 Pomegranate sorbet: Tasting notes: Best one I tried. Fruitiness comes through. Kinda good, icy but this was sorbet, not yogurt. Greek yogurt honey: Tasting notes: no honey flavor, no greek yogurt flavor. Did not try: pistacchio, tart, strawberry banana. I was down in the south bay for a conference, and it was an incredible 85 degrees outside. It wasn't possible to stay indoors, nor was it possible to not crave frozen yogurt or ice cream in that sort of weather! And ... there were multiple frozen yogurt shops within a mile of the conference location. So, I may or may not have ditched one session in order to go on a frozen yogurt crawl ... stop #1 was Yogurtland. I'd been to one of their other locations before in Berkeley, but didn't really remember it well. Yogurtland is a self serve setup, pay by the ounce. 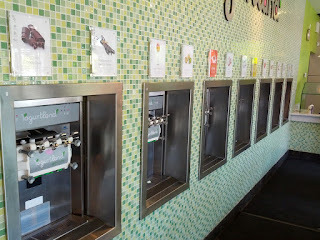 This location has an 14 flavors available at a time, both sweet and tart, non-fat and low-fat. Their web site lists many more flavors, some of which sound awesome! They also have just about every sort of topping you can imagine (candy, cereal, fruits, syrups, etc). Overall it was decent frozen yogurt, pretty creamy and flavorful. They use real ingredients to flavor all of their yogurts, rather than artificial flavors, which you can really tell makes a difference, as the flavors are more intense than I'm used to in frozen yogurt, and it isn't just sickeningly sweet. An incredible 14 flavors are on offer at Yogurtland! Dutch chocolate: "Dutch Chocolate is the smooth, sweet variety that gives hot chocolate its famous deliciousness". Made with Ghirardelli chocolate. Nonfat. Tasting notes: creamy, with ok flavor. Nothing standout. Madagascar vanilla bean: "Hand harvested from a tropical orchid, Madagascar vanilla is the second most expensive spice in the world and in a flavor class all its own." Made with real madagascar vanilla. Nonfat. Tasting notes: This clearly had real vanilla bean in it, and had bean specs throughout. Ok, but not that intense vanilla flavor. Moderately creamy. Peanut butter: Low fat. Made with real peanut butter. Tasting notes: disappointing, usually one of my favorite flavors. Not much peanut butter flavor, even though made with real peanut butter. Mediocre creamyness. Dulce de licius. Low fat. Made with real caramel. "The perfect match of sweet cream and decadent caramel. " Tasting notes: This was really good. Very creamy with a nice caramel flavor. Toasted coconut. Non fat. Made with real toasted coconut. Tasting notes: Good creaminess, super strong coconut flavor, really interesting texture from real coconut flakes inside of it. I really liked this one. Taro. Non fat. Tasting notes: creamy, really good taro flavor. Another winner. Lucky mint creme: "Smooth, rich crème with a bright pinch of fresh mint". Nonfat. Made with real mint. Tasting notes: Did not like this one. It was not very creamy, and tasted kinda like toothpaste. Fresh strawberry. Non fat. Made with real strawberries. Tasting notes: icy, not creamy, not very good. Pecans and praline: "sweet southern pralines and fresh toasted pecans". Non fat. Made with real pecans. Tasting notes: creamy, really full of pecan flavor. Red velvet cupcake batter: "Rich cocoa, hints of vanilla and butter cream." Non fat. Tasting notes: very creamy, good red velvet flavor. 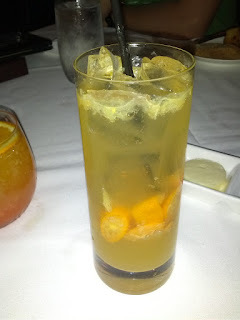 Tangerine tango: "Tangerines and Kumquats". Non fat. Made with real tangerines akd kumquants. Tasting notes: Tart. A little icy, but in a sorbet sort of way. Nice citrus flavors. Plain tart: Non fat. Tasting notes: ok tartness, a little icy. Did not try: pistachio, kona coffee. If you have been following my blog, you know that the restaurant I eat at the most often these days is Alexander's Steakhouse. You can read all my past reviews on why I love Alexander's so much, so I won't bother repeating myself here. I've been going to the location in San Francisco, but Alexander's actually has its original, and Michelin starred, location in Cupertino. Back when I worked in the south bay, that Alexander's was my place to go for special events. I had many memorable fantastic meals there, including one where we sat at the chef's table inside the kitchen, and were able to jump in and help prepare our own dishes. I hadn't been back to that location in at least a few years though, since I no longer work down there, and with a location in San Francisco, I have no need to journey all the way there for a great steak. But ... the menus at the two restaurants are actually fairly different (other than what cuts of steak they offer, and a few signature items like the hamachi shots and caesar salad). And the Cupertino location has been posting images of all sorts of dishes they have been creating, which I've been just drooling over. So when I found out I'd be in Cupertino for a conference for work for a few days, I knew Alexander's was on my agenda. I quickly made reservations for dinner, but also noticed that they were open for lunch! I'd be at the conference for two days, and as soon as I saw the conference food, I knew that I needed to go to Alexander's one day for lunch and the next for dinner, to try out both menus. The lunch and dinner menus are also completely different, with lunch being more salad, burger, sandwich based, and significantly lower priced (of course, there are still plenty of steaks and foie gras to be had as well!). The restaurant was just as gorgeous as I remember. I love walking into Alexander's. To enter, you walk past a room where the meat is all being aged. Huge slabs of meat everywhere. And then you walk past another area where they have all of the different cuts out on display. You can see the incredible difference in marbling with all of the high end wagyus. And then you reach the hostess stand and small seating area, with a roaring fireplace. A swanky bar comes next. The dining area is separated into a few different rooms, keeping the space feeling imitate and the noise level down. To reach most tables, you walk by one of the open kitchens and the tanks of live lobster. By the time you are seated, you basically want the entire menu! I had no idea what to expect from lunch. Would it be more casual? Would it include an amuse bouche, bread service, cotton candy, etc? (yes, no, yes). It was certainly more casual, but not in a good way. Rather than the precision service one is accustomed to at Alexander's (and any Michelin rated establishment), service was really quite sloppy and off. At one point, a server started bringing over some of the entrees, only to reach the table and realize that it hadn't been re-set from the appetizers, so we had no silverware. So they brought out the silverware, and then brought out some burgers, delivering them to the wrong diners. This was made even more confusing as they were declared to be cooked to doneness levels that weren't what people had ordered. They were taken away again, but the same burgers ended up coming back, so I'm not sure if they just said it wrong the first time, or if they just hoped people would not notice. The biggest issue however was lack of coordination between the kitchen and the servers, resulting in food arriving cold and not at the same time. I was seated with full view of the open kitchen, so I could see everything going on. For entrees, our table ordered three regular burgers and then some other dishes. I watched the first burger (ordered rare) come up, and start sitting under the heat lamp. It was there for several minutes while the other burgers were being cooked more. Eventually all of the burgers were up and under the lamps. At this point, the server tried to bring them over, realized the table hadn't been re-set after the appetizers, and returned them back to the kitchen, but not under the heat lamps. When the burgers finally came back, the one that was ordered rare had been off the grill for at least 10 minutes, and, as you would expect, the person who ordered it said it was cold (he hadn't been watching all the shenanigans either, so had no idea just how long his burger had been sitting). Even more strangely, the rest of us did not receive our food at this point, even though the burgers had obviously been ready for quite a while. It took several more minutes for the other dishes to slowly trickle out, while the burger eaters sat there trying not to be rude and start eating, but knowing that their burgers were getting even colder. This is soo different from what I am used to at Alexander's, where normally the servers swoop in and serve everyone at once! A few other strange service issues stuck out. 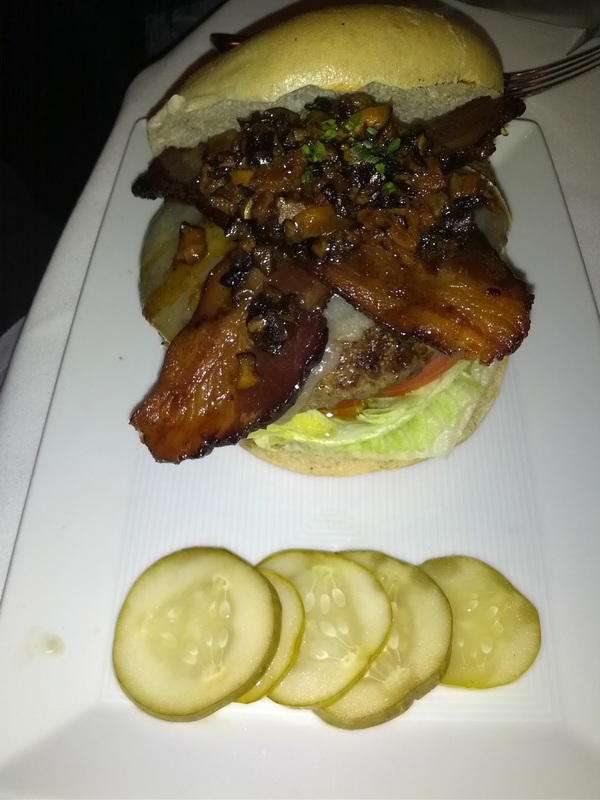 One person ordered a burger, and asked to have it topped with a piece of seared foie gras. 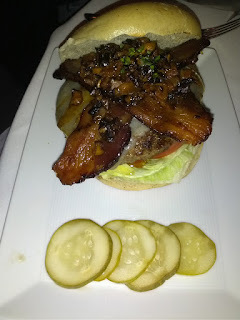 On the menu, you can always add a piece of seared foie gras to any steak, and this diner always adds it to his burger in San Francisco. It has never been an issue there. But the waitress said that they couldn't do it, but that she could bring it as a side, and that he could construct it himself. This seemed rather odd, but ok, he could transfer it from the side to the top of his burger. But what he received wasn't a side of seared foie gras, it was the appetizer preparation, with elaborate plating, and a bunch of other components, which he clearly wasn't going to use with the burger. 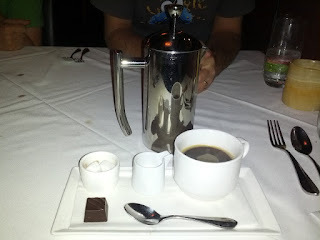 This was also more expensive than just adding a piece of seared foie gras, and certainly not what we were expecting. And another diner, when ordering his burger, asked to have it prepared however the chef recommended. The waitress wouldn't accept this for an answer, just repeating over and over that it needed to be prepared how HE wanted it. Again, odd. Normally they are happy to tell you that the chef recommends medium-rare. And finally, we were running really late and needed to be back at the conference, so we asked for the bill. The waitress came back quite some time later, asking if we wanted dessert or coffee. No! We asked for the bill because we really, really needed to leave. Overall, our meal was ok, but with all of the service weirdness, and some execution issues on the food, I probably wouldn't be back if I didn't know Alexander's reputation already. When I returned the next night for dinner, it was a radically different experience (review coming soon), and was what I expected from Alexander's. 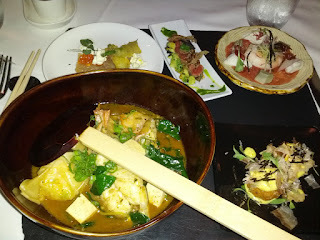 The value at lunch is certainly higher than dinner, particularly with the crazy lunch set (see below for full review). If I'm in the area again for lunch, I'll try it out again, as I think they are still just working out some issues with lunch service, as it is relatively new. Amuse bouche: cauliflower soup, bacon and cheese roll. This was a pretty substantial amuse bouche, particularly for lunch! But the idea of a little starter soup does go perfectly with lunch. 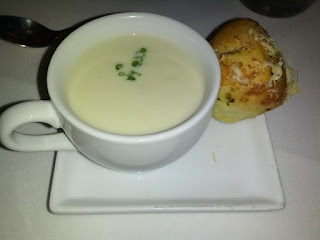 The soup was creamy, a little salty, and rather thick. It was fine, but nothing particularly memorable. The roll was served cold. It had a nice topping of cheese, but not much bacon flavor at all. 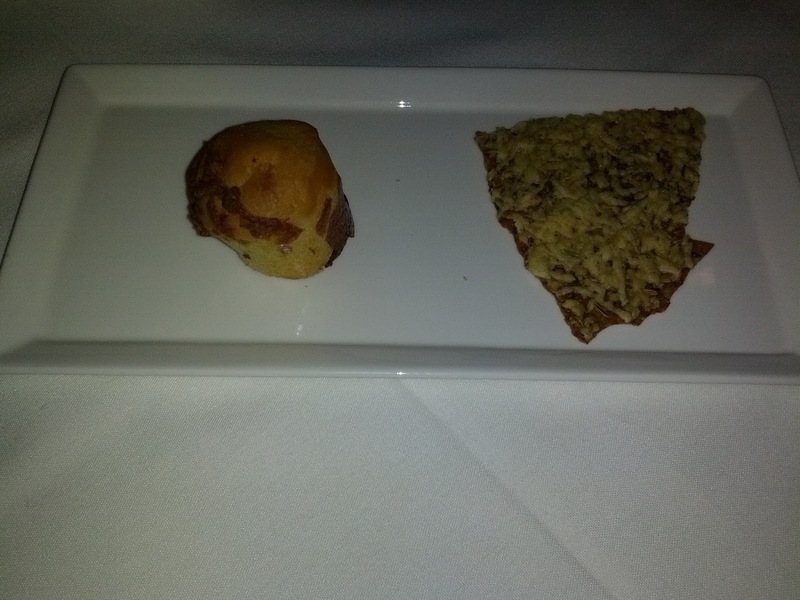 This was served in lieu of a formal bread service. Seared Foie Gras: mango gastrique / charred mango / apple-almond relish / brioche / mango chips / togarashi. $28. 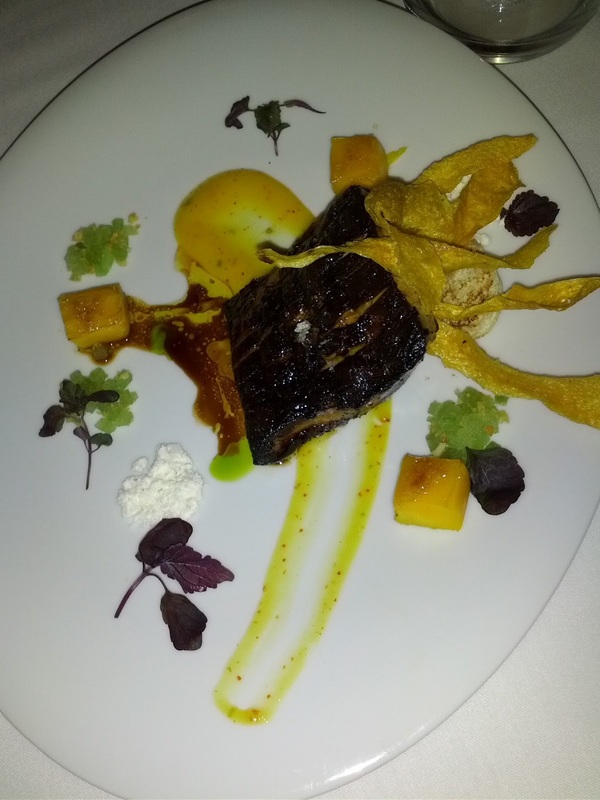 The mango came three ways: charred, a gastrique, and chips. The charred mango was just some cooked chunks, not particularly interesting. 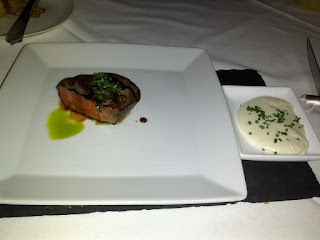 The gastrique was sweet and flavorful, and paired well enough with the foie gras. I love seeing all of the different fruits that chefs pair with foie gras, and this worked pretty well, perhaps a little too sweet though. The mango chips were crisp and tasty, although they didn't go that well with the dish itself, I enjoyed just eating them on their own (and in fact, when the second order of this arrived as the "side" to the burger, I just ate all of the mango chips on their own). 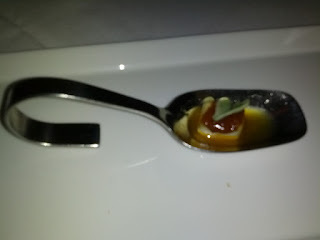 The apple-almond relish was tiny little cubes and paired better with the foie gras than the mango, as it was a little tart. 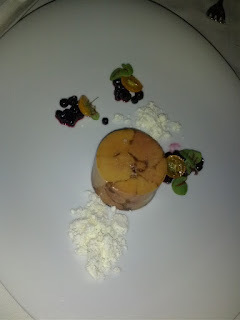 The little chunks of brioche were fine, but not very substantial given the amount of foie gras. You basically got to try one bite with some brioche and that was about it. There was also some foie powder on the plate. 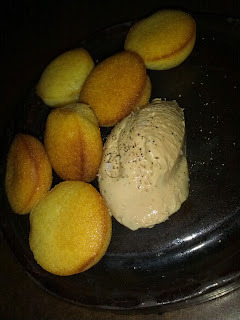 I just love foie powder, love dipping just about anything in it. A little bit of the seared foie, dunked in extra foie powder, with a tiny amount of apple relish was definitely the best bite for me! The foie gras was a decent size and very creamy. It was however, over-seared. 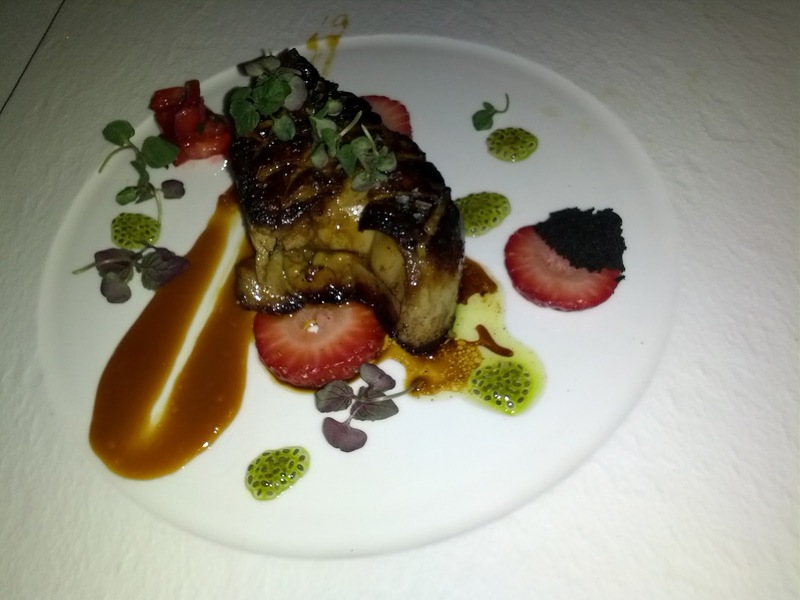 I love a good sear on my foie, but as you can somewhat see this in the photo, the crust was just too much. It tasted a little on the burnt side. This was probably the weakest execution of seared foie gras I've ever received at an Alexander's, with the mediocre fruit pairing and the over-searing. The second order of this came slightly less over-seared and was much better. At $28, this was pretty standard pricing. There was only one preparation of foie gras listed on the menu (the seared one), but I asked the waitress if they had anything else available. I wanted the folks who were just learning about foie gras to get to experience another type too! She said that there was also a torchon. I quickly ordered that to treat my newfound foie eaters to a cold preparation too! We were rather surprised when this arrived. When she said a torchon, I kinda expected ... a torchon with some brioche. But, I had read about the foie gras nachos on their Facebook page, and was sad that it was no longer on the menu, so I was excited to get to try this. It sounded pretty unique, and shaved torchon can be quite tasty too! The nachos had shrimp chips as the base rather than tortilla chips. They were crispy, rice based, but didn't really have much shrimp flavor. They were shaped into little wavy cups that worked pretty well for filling up with the other components and eating as finger food. The citrus salsa had some really flavorful kumquat in it, that paired well with the foie and I really enjoyed. 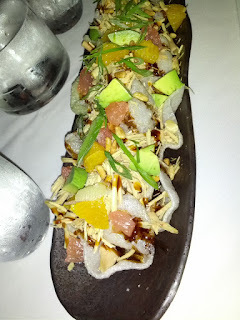 There was also some shaved radish, carrots, and avocado chunks which all added some freshness. It was drizzled with kabayaki sauce for a little extra flavor. 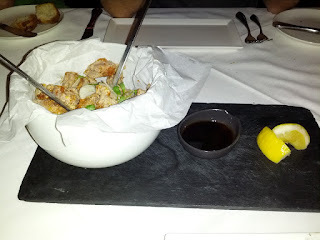 The foie gras itself was really lost though. The shaved pieces just weren't really substancial enough to taste. I was sad that the folks who had never had a cold foie preparation before had this as their first experience! While I thought this was a creative and fun dish, and it really was a fairly accurate play on nachos, it just didn't work very well. The flavors all just competed with each other, with nothing really coming through. I wouldn't order this again. The lunch set: hamachi tartare, beef tataki, crab and prawns, crab cakes, ramen with prawns and lobster dumplings. $29. ZOMG. Described on the menu as "Our version of a bento box. 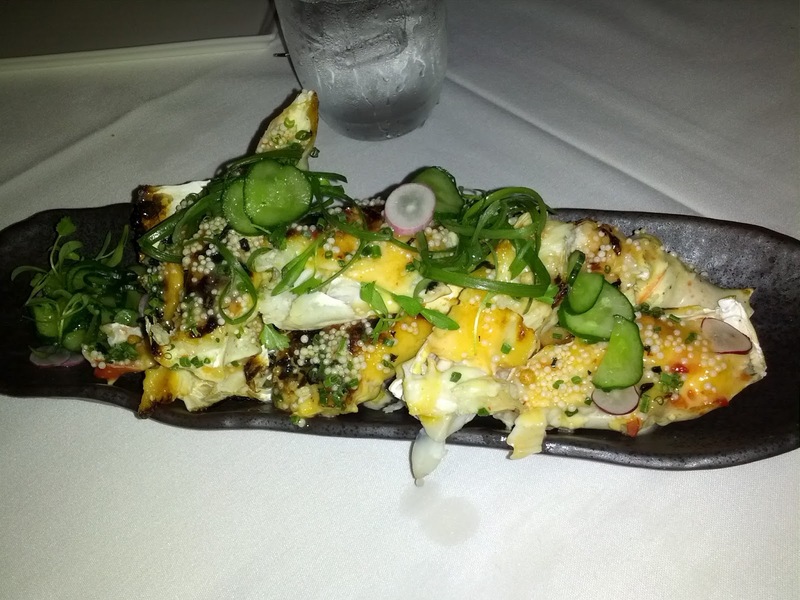 Multiple small plates combined on one that offer a multi- coursed lunch at one time." The lunch set changes every day, and is made up of whatever the chef wants to throw in. I was super excited by this, as it seemed like a great way to get to try out a bunch of the dishes! When the waitress listed off the things included that day, I was sold immediately. Crab cakes! Lobster dumplings! Hamachi! More crab! All things I love! And I thought, a bento box is a cute little thing! I was a little worried about it being far too much food given the foie gras starters, the fact that it was lunch time and I'd had a pretty sizable breakfast smorgasbord at the conference just two hours earlier, and that I had dinner plans for an elaborate dinner just four hours later, so I asked the waitress how sizable this was, and she said it was just a taste of each item. And at $29, I figured it couldn't be that big, particularly given that it was going to include a bunch of big ticket items. Um, this thing was an insane amount of food. I wish there was something in this photo that could be used as a measure of scale, as it is rather hard to tell from the photo just how enormous this was. The ramen dish alone was bigger than any dish of ramen I ever had in Tokyo. And that is when I'd be ordering ONLY a dish of ramen, and at dinner time! Not only was the bowl of ramen enormous, it came topped with two huge fried prawns, cubes of tofu, and two giant lobster dumplings. That single "small plate" alone was far more than I needed for an entree, even if I hadn't had all the starters, a big breakfast, and upcoming dinner plans. And then throw in the tartare, tataki, other seafood, and two crab cakes? Insanity. I can't believe this was only $29. This is an absolutely incredible value for the amount of food, particularly given that it was all seafood. I could have easily split it with someone, and still probably not finished it. I applaud them for the crazy value, but I hate wasting food, and this just wasn't appropriate for a lunch portion. There was a lot of variety on this plate, starting with a raw dish, then moving on to cold dishes, and finally the hot dishes. It was basically like getting the chance to have a huge variety of appetizers, which tend to be my favorite dishes anyway, so I was into this sampler style. 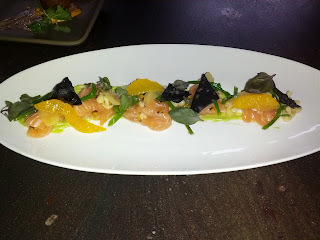 The hamachi tartare came topped with trout roe, squid ink crumble, tempura green beans, and popcorn. Yes, it was actually just popcorn. Given Alexander's reputation for playful fun creations, I figured this was something else made to look like popcorn, but it was indeed just popcorn. It totally did not go with the tartar and I have no idea what on earth it was doing on this plate. 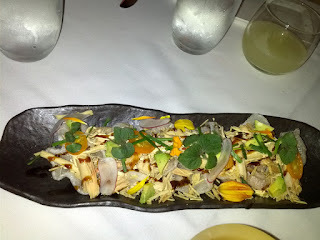 The hamachi was fairly fresh and a decent cut, but not particularly flavorful. The trout roe added a good salty component and a nice pop. The tempura bean was cold, over battered, and too oily. I didn't find the squid ink crumble that the waitress said was there. Overall, this was a fairly generic hamachi tartare preparation, not bad, but not particularly notable. 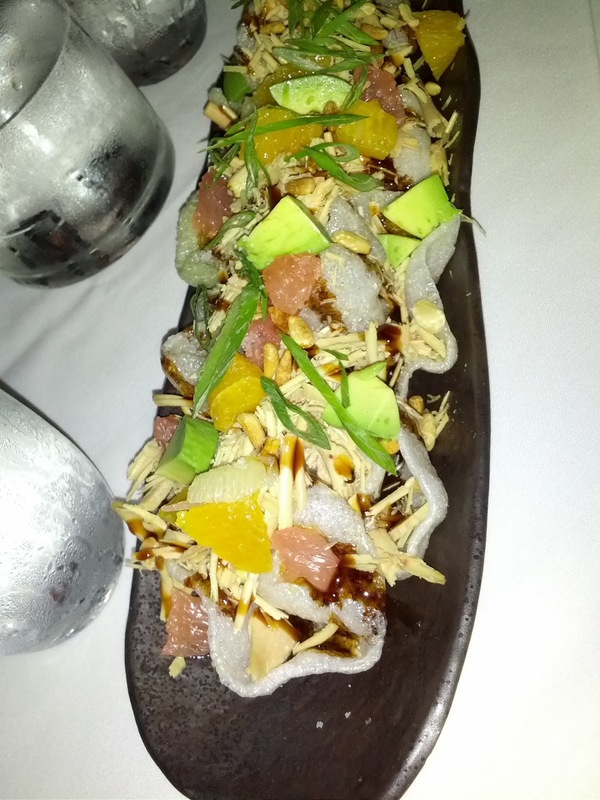 The steak tataki came topped with lotus root chips and was served over a bed of smoked avocado chunks. The lotus root chips were salty, crispy, and tasty, although not really necessary. I only had a tiny chunk of the smoked avocado since I'm allergic, but I didn't get much of a smoked flavor from it. The tataki however, was delicious. Insanely flavorful, with a great crust on the steak, but also nicely rare on the inside. Tender and served at a good temperature (cold, but not too cold). Like all of the "small plates" this was a generous portion, 7 or so slices. By far the best component on the entire lunch set. Next was a rather strange dish. Two poached prawns, several chunks of crab meat, chunks of asparagus, on top of a tomato based sauce, topped with a little bit of nori. It was all served cold. This was the weakest dish of the set. The crab was a little on the fishy side and not particularly flavorful. The prawns were really, really fishy. I didn't like them at all. The tomato sauce was nice and went well with the prawn. These components didn't really come together at all, although I get that it was supposed to be a light, fresh, dish. And next was not one, but two crab cakes, topped with mustard aioli and bonito flakes. I love crab cakes, and this was a dish from the normal appetizers menu that I had been wanting to order the next night anyway. These were pretty good, with a nice sear on the outside, and plentiful, shredded crab meat on the inside. It was a fairly standard preparation, nothing all that surprising, and not nearly as good as the last crab cakes I had at Lot 7! And finally, the vat of ramen! It came with a rather amusing paddle like spoon, that wouldn't even come close to fitting inside my mouth, but did match the size of the dish :) The noodles were ok, fairly firm, but were all clumped together. The broth was miso based, had a nice level of saltiness, but didn't really have anything to it that made you want to go back for more. The tofu cubes were just standard medium-soft tofu cubes. You can't see them in this photo, but there were two giant butterflied prawns. They were really hard to eat. Since they were inside the soup, they were wet and slimy, but were still inside their shells, so you needed to extract the meat. I was trying to use my fingers, but that was very messy, and I'm not sure how I would have ever done it with just chopsticks. There were also two sizable lobster dumplings, about 6 bites each (I'm not exaggerating here, they were massive, they just don't look it in this photo since you can't tell how huge the bowl is!) 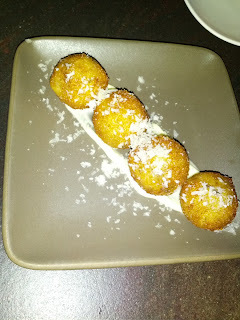 I was really excited for these, as they were another item on the dinner appetizers menu that I had wanted to order. Unfortunately, they weren't very good. Far too doughy, with the ratio of filling to dough being off. And the filling was kinda just a mush, not particularly flavorful, and I couldn't detect any actual lobster meat. Again though, this was an insane value. $29, for 6 spoonfuls of tartare, 7 slices of tataki, 2 small prawns, 2 large prawns, 4 chunks of crab meat, 2 crab cakes, 2 lobster dumplings, a bowl of ramen, and all of the other stuff on the plate. Incredible. I would actually totally be willing to try this again, I'd just be certain to split it with someone instead of ordering it alone! Niman Ranch Cheeseburger : 10 oz. / toma cheese / shortrib-shiitake ragoût / cherrywood bacon. $16. This is what half our table ordered. They all were rather blown away by how big it was. Not a single person at the table was able to finish it. Not pictured is the other burger ordered, the "Beef & Reef" ($24), which came topped with lobster salad and pepperjack cheese, on a totally different bun. The person who ordered that really seemed to enjoy it. Someone else also ordered the prime rib french dip ($22), and he also seemed to really enjoy it. There were also a few orders of the classic parmesan truffle fries ($10), which were, as usual, crispy, salty, and full of cheesy goodness, but arrived on the cold side. The waitress also tried to convince us to order even more fries than we did, saying that each order was appropriate for a single person, but I knew better than this, and encouraged people not to order one each. Even with only two ordered, more than half of them went unfinished. She also tried to get everyone to order salads or other sides as well. Did she really not realize how much food this was, with the foie gras starters, the giant burgers, and all those fries? I hate seeing food go to waste, and try as we might, we just couldn't get through all of this food. The burgers all were very reasonably priced for quality components, but $10 for fries seemed a little steep. Not pictured, is the conclusion of our dinner, the signature Alexander's cotton candy! Pina colada was the flavor of the day, and it was pineapply, coconuty, sweet, and a nice finish to the meal. I love seeing people who have never been to Alexander's receive the cotton candy for the first time, as they are always so surprised!